Toshiba Carrier Group strives to be a company that contributes to society and cherishes communication with its local communities. Activities include inviting local elementary school students on factory tours and meetings with local community representatives to share information on business operations. We actively listen to the voice of the community to promote an environment of "coexistence and harmony". Toshiba participates in the "Fuji Beech Forest Development Project" sponsored by Fuji City, Shizuoka Prefecture, to plant trees every year. The 22nd event held in 2015 was on ‘Toshiba Group A Day of Global Environmental Action’, where ‘Eco Style Leader’, eco-conscious leaders from the Fuji Factory & Engineering Center were accompanied by their families in the event. 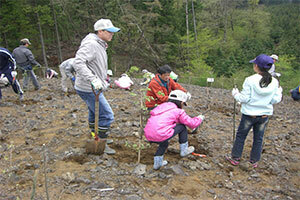 As part of Toshiba's plan to plant 1.5 million trees, Toshiba has signed an agreement with the "Shizuoka Forests of the Future Supporter” project to help alleviate costs and provide volunteers for tree-growing activities. To date, about 35 million trees have been planted in 'Children's World', an area near Mt. Fuji. 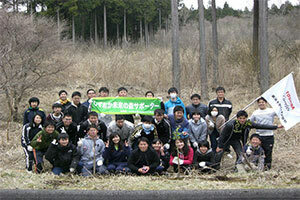 The effort continues by helping to maintain the forest. Employees and their families participate and share in the understanding of nature and the importance of preservation of the global environment. 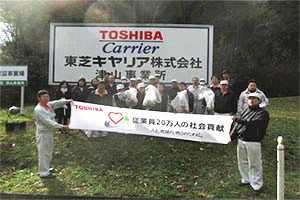 As part of the activities for "Shizuoka Forests of the Future Supporter," since 2010, Toshiba Carrier purchases paper, used for printing the annual Environmental Report, from ‘Fujinokuni Mori Neighborhood Association’. A portion of the paper cost contributes to the funding of forest thinning activities. The forest can continue to grow successfully thanks largely in part to the planting of trees but also foliage thinning activities. The wood and resulting pulp obtained from thinning is utilized for production of paper products. Every 10th of the month is declared “Toshiba Day”, on which Toshiba Carrier Group members pick up and clear roadside trash in the community. Approximately 120 people from various sites participate in the event and contribute to the aesthetic improvement of the local area. 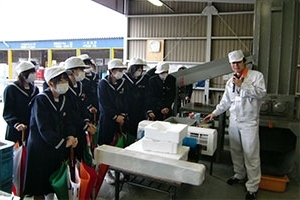 Toshiba Carrier Group invite students on a factory tour to introduce our environmental activities. AIRS showroom (Fuji Factory & Engineering Center / air conditioning system information center), HeaRTS showroom (Kakegawa Engineering Center), various production lines, and state-of-the-art environmental product development facilities are a part of the visit. 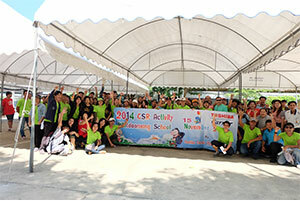 Toshiba Carrier Group holds environmental awareness activities for elementary school children every summer. Activities are operated out with the cooperation of a nearby university. 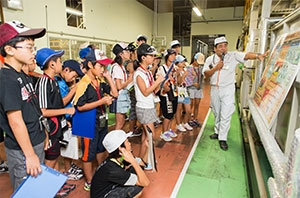 Aobadai Children’s Club (Fuji City, Shizuoka Prefecture) and students of Tokoha University (Fuji City, Shizuoka Prefecture) are invited to learn about the environmental biodiversity conservation activities at the FujiFactory & Engineering Center. 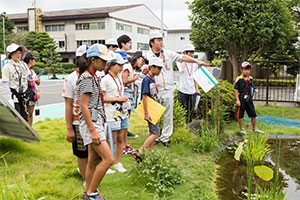 Elementary school students visit the compressor manufacturing line, and green-friendly areas like the biotope and park areas to learn about production and the ecosystem. 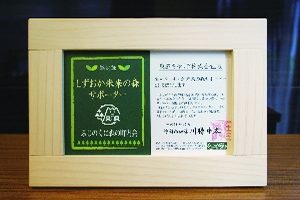 As a keepsake of the tour, each student is given and eco-bag which they can decorate themselves. Many creatively unique eco-bags were designed by the students. 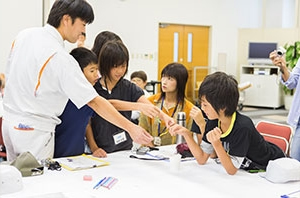 The Toshiba Carrier Group places great importance on communication with the local community, not only in Japan but at various global operation bases. Toshiba Carrier Thailand Corporation has begun mass production of business-use air conditioner with improved greatly performance over conventional-type models. In the near future, new residential products will be developed, expanding the product lineup. To improve energy efficiency in the factory, 90% of the lights have been replaced by LED lighting. Among various other activities are interaction with nearby schools, and donation of LEDs to replace old fluorescent lights at government offices. TCFG Compressor (Thailand) was established as a joint venture with Fujitsu General Corporation, for the manufacturing of compressors for air conditioning. The energy-efficient compressors are used in air conditioning systems for residential and business use. In 2014, having received Toshiba’s comprehensive environmental audit, TCFG aims to further strengthen environmental activities. As part of CSR activities, it donated air conditioners to Sriracha City. 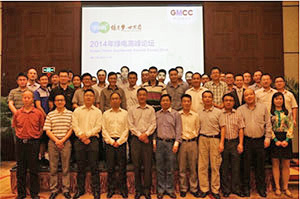 Guangdong Meizhi Compressor Co., Ltd is an industry-leading top manufacturer of compressors having sold approximately 26 million units worldwide in fiscal 2014. Under the concept of “Green Appliances," the manufacturer strives towards realizing sustainable production and a low carbon society, through products that are energy efficient and utilize environmentally friendly refrigerants, a highly efficient production systems, and the active pursuit of the 3 R’s (Reduce, Reuse, Recycle). Toshiba Carrier Air Conditioning (China) produces air conditioners for residential and building use in Hangzhou, China. 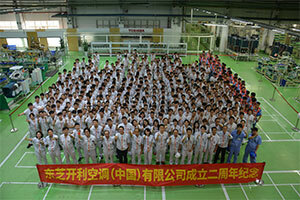 Under the aim to be “a factory to be admired", a clean, comfortable, work-friendly production line has been realized. Factory visitors can see on tour how air conditioning and heat pumps systems work and learn about the energy efficient systems. Toshiba Carrier Air-Conditioning Sales (Shanghai) Co., Ltd., contributes to environmental improvements in China, the world’s largest air conditioning market, by providing customers with high-quality, energy-efficient air conditioning systems. In terms of education and culture, it has participated in the rebuilding of a dilapidated elementary school through the "Hope Elementary School Project." Furthermore, it supports Chinese football and is the main sponsor of the Hangzhou Greentown FC, professional football team.